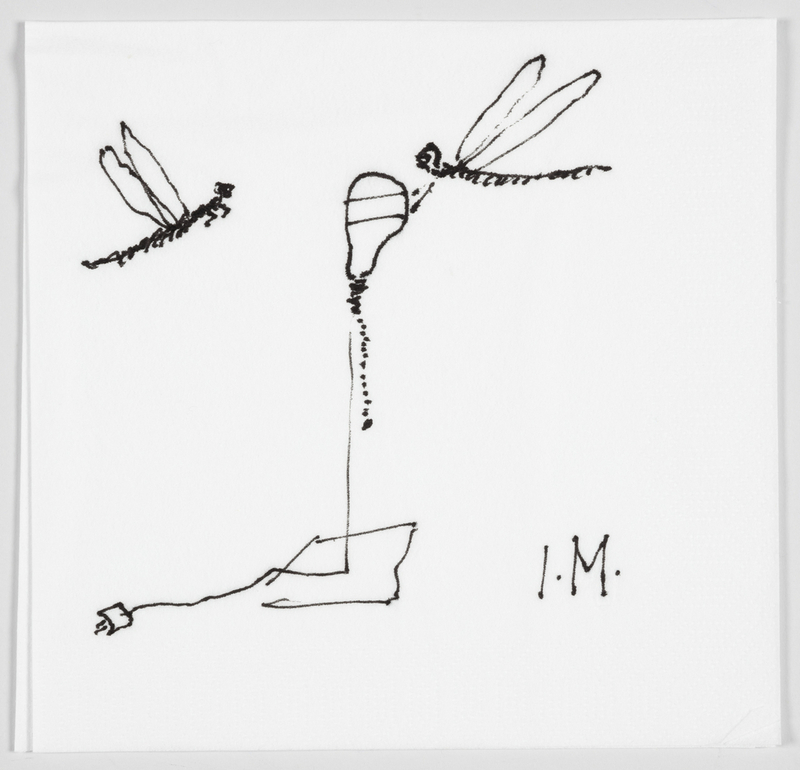 This is an early concept sketch for the lamp “I Ricchi Poveri – Silver Bzzzz” by the “poet of light” Ingo Maurer. The lamp is part of a small series through which Maurer has sought to play on the natural attraction to light in nature. In the design for “I Ricchi Poveri – Silver Bzzzz,” Maurer captures a moment in time with a handmade silver-coated aluminum dragonfly resting on a halogen bulb. This sketch, one of several that Maurer executed with pen and ink on white napkins, shows the simple silhouette of the table lamp in an iteration close to the final design. The final lamp features a curved thin brass stem, which appears to delicately bend under the gentle weight of the dragonfly at rest on the bulb. Caitlin Condell is the Assistant Curator and Acting Head of the Drawings, Prints & Graphic Design Department at Cooper Hewitt, Smithsonian Design Museum.